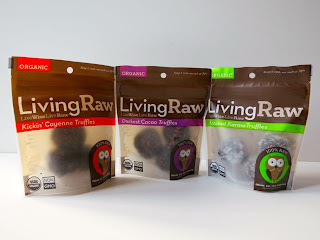 The best product I tried at the entire Expo West show was the Living Raw truffles. 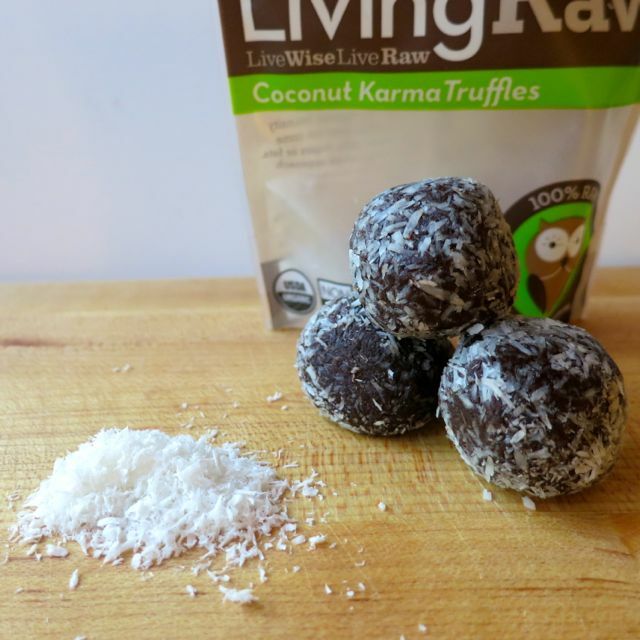 Living Raw is small company that just makes raw truffles. Each truffle is hand-crafted with wholesome ingredients that are all raw, organic, vegan, gluten-free, and non-GMO. So why was I so excited about these raw truffles? Because they are some of the best I've ever had--no joke! 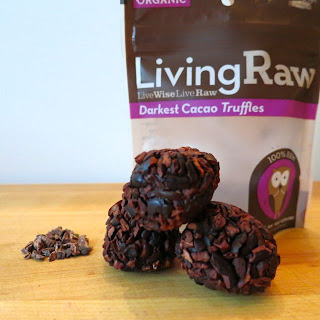 These truffles are the most decadent raw truffles you will ever try. They are incredibly large and super soft and smooth. Take the Coconut Karma Truffles made with cacao powder, cacao butter, coconut oil, agave, coconut, vanilla, and pink Himalayan sea salt. This truffle will leave you saying, "wow," as bite into its smooth coconut-covered outside only to find chocolate goodness inside. The Kickin' Cayenne Truffles were just as good with that bit of spice that I like! 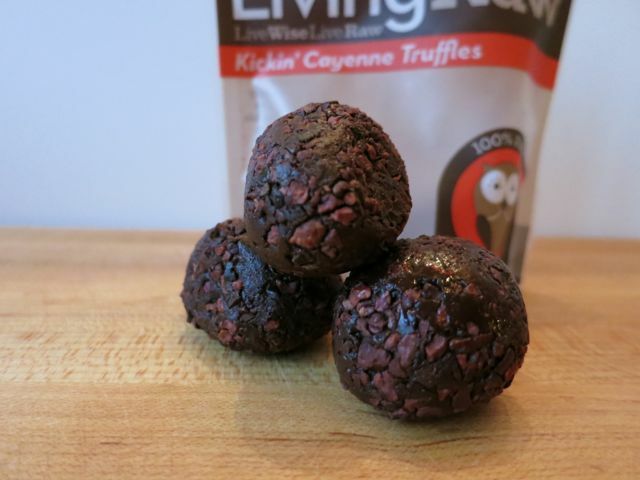 There were chunks of cacao nibs layered with cayenne all throughout each truffle! Goodness gracious. But, perhaps best of all were the Darkest Cacao Truffles coated with huge cacao nibs. These must be enjoyed with a nice bottle of Cabernet Sauvignon. Why raw? As Living Raw states, "raw food is unprocessed living food, complete with all of its naturally occurring enzymes and vitamins. Raw foods do not undergo any blanching, chemical bleaching, pasteurization or altering of any kind. Eating food in its natural state is a simple way of eating, and it's easy to incorporate into our daily lives. Making wise choices with food habits will add up to make a profound difference in our lives and in our bodies." I couldn't have said it better myself. This is perfection in a raw truffle. No two ways about it. If you'd like to try them yourself, you can order them here. A container of 9 truffles costs $18 with free shipping and believe me, it is totally worth it. These would make a great gift! Full Disclosure: Although the products were provided to me for free to review, that in no way influences my veracious opinion. These are amazingly good. And I like that they are made without raw sugar. Sugar effects my blood sugar levels adversely. Best tasting cholocate! Sio I searched on line to find this product.